Greetings, geek fans! Today I bring you a treat from the late 80’s. 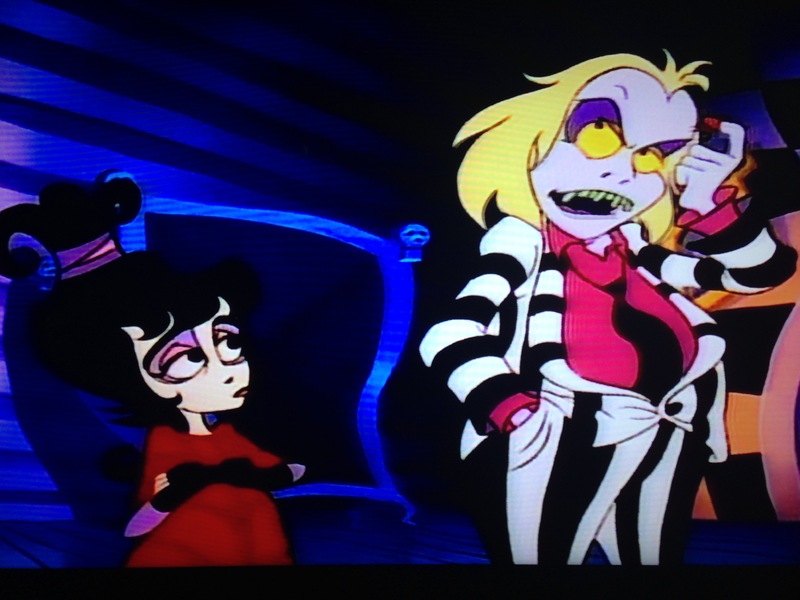 Some of you may not be aware that in addition to the Tim Burton movie, there was also a Beetlejuice cartoon. There are great nods to the movie throughout, such as the exterior of the house, and music by Danny Elfman. However, there are key differences. There’s no Barbara & Adam, and Lydia and Beetlejuice are friends. As you know, I like to do the premier episode of a series, but it’s a drawn out babysitting gig. Instead I’ll be selecting one of the toons from the second episode, as it features more of the show’s characters, rather than establishing Lydia’s friendship with the ghost with the most, which is obvious, and didn’t really need to be stated. We can infer from context. Let the geeks begin! We open on a dark and stormy day. There are dogs barking, and we see a skunk pop up, and start running towards Casa Deetz. Inside, Beetlejuice and Lydia are dancing in the air. He says he loves it there. Where he comes from, when it rains cats n dogs, it really rains cats and dogs. Lydia questions him, and he responds with, “would I lie?”. She answers, yes. Beetlejuice puffs into an angel costume, and says she knows him so well. More barking outside, and the skunk runs up a tree. Beetlejuice opens the door, commenting how nice it is to have real rain hit his face instead of a dog or a cat. As he says that, the skunk jumps onto his face, and they tumble into Lydia’s room. Beetlejuice comments that’s it’s a cute woodland critter. Then he sniffs it, and says it smells good. Lydia tells him it’s a baby skunk. Then she says it needs to use less perfume. Beetlejuice sniffs it’s tails, and says corral no 5, and wonders where he’s smelled that before. Then he raises his arm, sniffs, and we hear a foghorn. Yay, gross out humor. Oh wait, it’s for kids. Burp! Fart! Pee! Am I popular yet? Moving on. Lydia, complete with nose plug, dries the skunk with a hair drier. Beetlejuice asks what she’s gonna do with the nose-number. Lydia says it needs a good home, at least until the storm clears. Beetlejuice shakes his finger at her, and reminds her of her mom’s warning about bringing insects, worms, and wild animals into the house. On cue, Delia knocks on the door. Beetlejuice hides in the closet. Lydia puts the skunk in there with him. The door opens and Delia says the smell is coming from in there. Now, given what I know of the effects of, shall we say, herbal refreshment, they should be giving Lydia the don’t do drugs speech right now. Lydia swears it’s the aftershave she bought for dad. He says he’s gonna grow a beard. Delia says that’ll make him look like a gorilla. He says why not, he’s gonna smell like one. No, hippie. You’ll smell like a hippie. They leave, and Beetlejuice compliments Lydia on her lie. She says she hated to do it, but she was thinking of Stinky. Beetlejuice says she won’t be able to keep it secret for long. Lydia tosses the skunk at him, and says it’s going to stay at his place. Beetlejuice starts to protest, but Lydia is already saying his name. As she says it for the third time he asks if he’s invisible. Too late. Time to go to the Neitherworld. The first thing we see there is a veggie stand called Rooty Bagas. Yay, puns! Beetlejuice says Lydia shouldn’t worry, and that a little white lie never hurt anyone. From BJ’s Roadhouse we hear a creepy voice from his closet repeating “lies, lies, lies”. Lydia walks up to the neighbor’s fence to say hi to his dog, Poopsie. Beetlejuice turns into a cat and harasses the dog. Lydia asks what’s wrong. He says the dog is always giving him a hard time, but doesn’t know why. From the now shaking closet we hear, “lies!”. Beetlejuice steps in front of his door and says he can’t have pets. 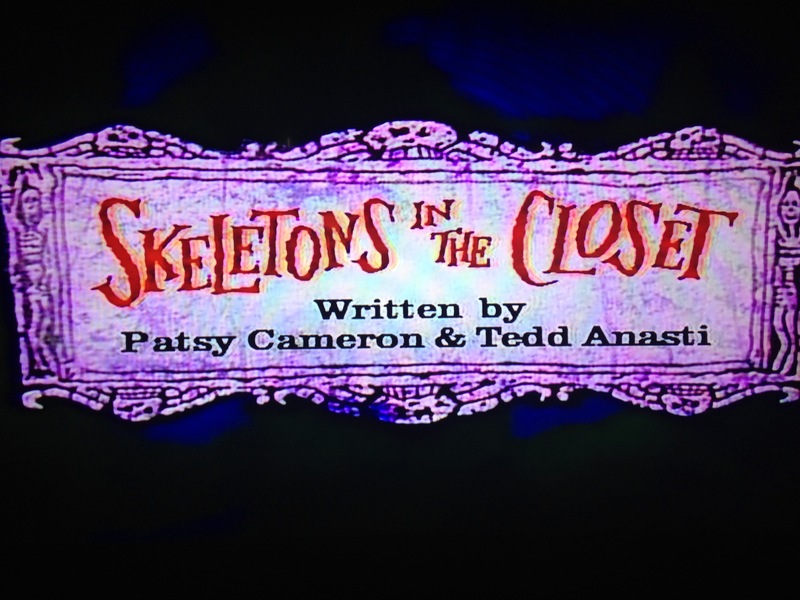 The door opens, and his skeleton friend, Jacque says they can’t have pests, even though Beetlejuice lives there. Jacque says Lydia’s friend is always welcome, no matter how it smells. Beetlejuice calls him out on not having a nose. 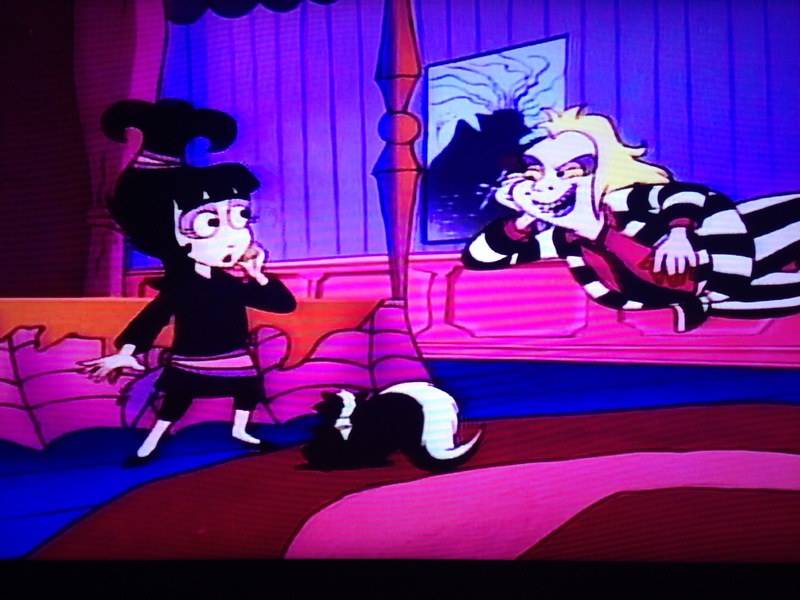 Lydia declares that Stinky can stay, then asks Beetlejuice if he ever tells the truth. He says he does all the time. Then we hear the voice say, “Beetlejuice is lying.” He says that’s a song his neighbor’s sing. We then hear more of “Lies, lies, lies”. Inside, we meet a lady spider named Ginger. She tells Lydia she likes her skunk, and doesn’t even mind the smell. Beetlejuice whispers that if she had eight feet smell wouldn’t bother her either. Ginger asks if they want to see her new dance step. Without waiting on an answer, she starts dancing. 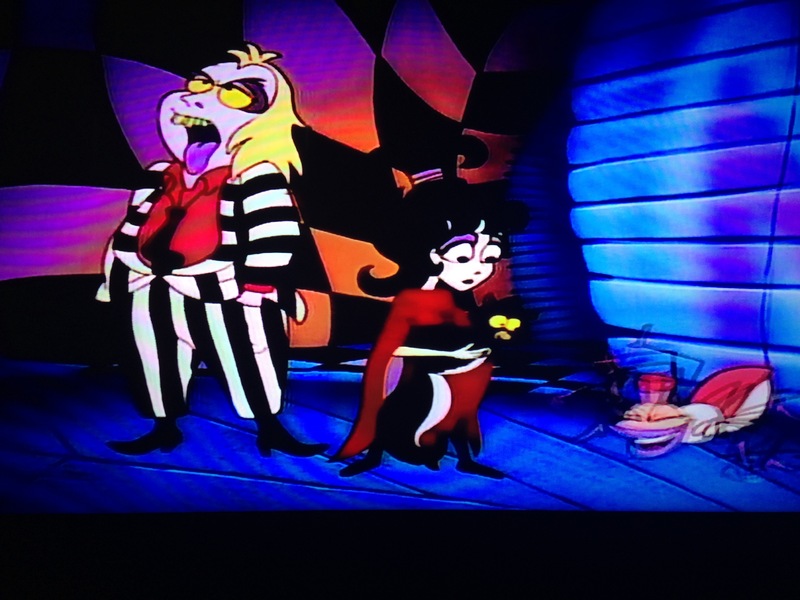 Lydia and Stinky watch, while Beetlejuice pulls a face. When she finishes, Ginger says those dance lessons he sold her are paying off. He replies that yeah, they look great. We hear the creepy “Beetlejuice is lying” again. He looks at the closet, and there’s streams of light coming from it, with the chant of “lies, lies, lies”. Beetlejuice looks worried, and quickly hammers the closet closed. Lydia says something strange is happening. He says nothing strange ever happens to him. That’s when the doorbell rings. It’s the monster across the street. He’s Texan, and has the voice to match. 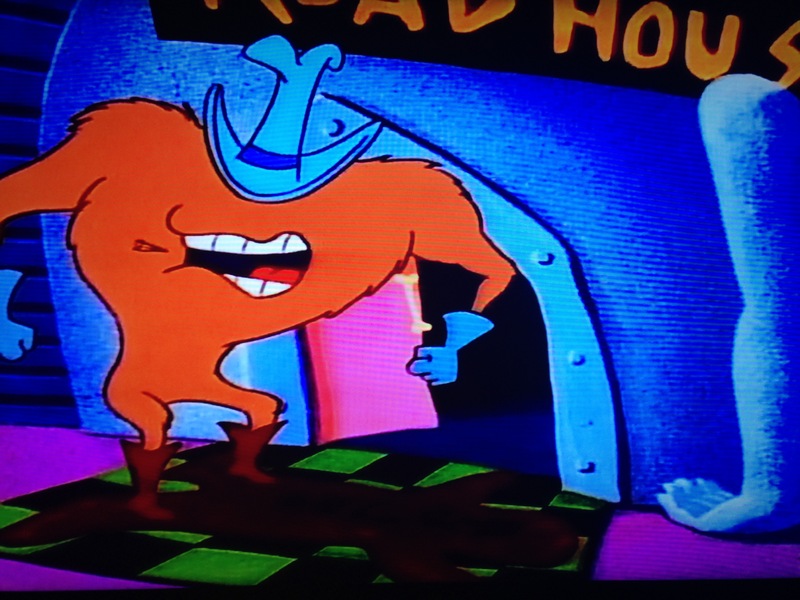 He’s a cross between Yosemite Sam and the Red Monster from Looney Tunes. He asks if Beetlejuice has bothered his dog. Beetlejuice says no, and the boards he just nailed in come breaking off the closet, and the door opens. Two ghostly skeletons appear, repeating “Beetlejuice bothers your dog”. Uh oh. The monster asks what he just heard. Beetlejuice loudly declares that he didn’t bother his dog. The monster asks why he’s so upset then. Beetlejuice says a mailman bit him. Monster says the mailman is gonna get a knuckle sandwich, special delivery. Light is still pouring out of the closet. Lydia and Beetlejuice stand against it. She asks what’s in there. He says talking dolls he got from the neighbor kids. He says he likes to good good deeds, it’s just who he is. The closet can’t take it, and burst open with a green light. Ghostly skeletons escape repeating the same “lies, lies, lies”. Lydia says he’s got skeletons in his closet. Well, HAD skeletons in his closet. Then two of them going flying to Ginger’s door, knock on it, and tell Ginger that Beetlejuice hates her dancing. Ginger starts crying. Skeletons go to the monster and tell him that Beetlejuice bothers his dog. Monster is angry. Skeletons tell Rooty Baga that Beetlejuice steals his fruit. 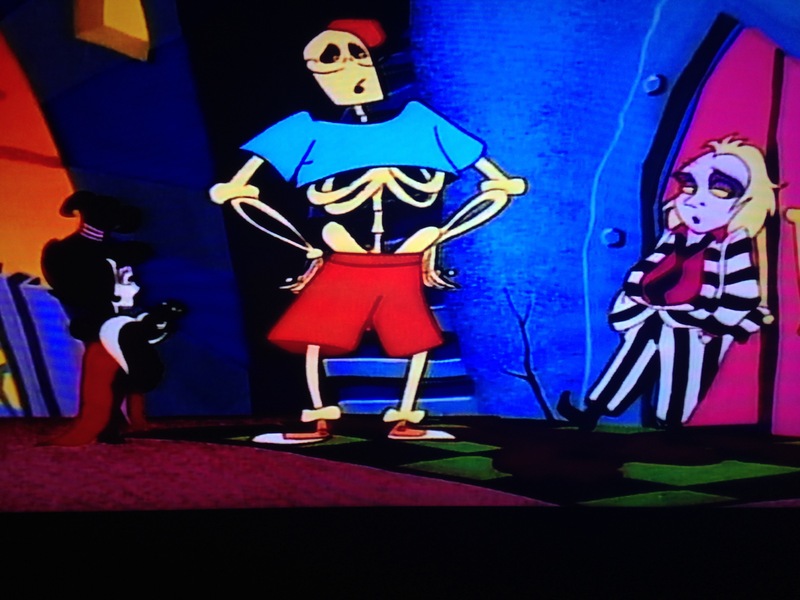 Lydia informs Beetlejuice that his skeletons are telling on him. Ya think? The closet glows, and a smaller, girly, skeleton comes out saying “Lydia lied to her parents”. Capt. Obvious tells Lydia that one was hers, and it’s gonna tell on her. Every lie you tell in the Neitherworld gets you a skeleton in your closet. Most closets can hold a dozen, but his closet is big. That’s why he moved into that place. Lydia’s skeleton starts floating for the door back to our world. Beetlejuice says over the years his skeletons just kinda, built up. Lydia asks how to stop them. He’ll have to look that up. Too bad an angry mob is forming. 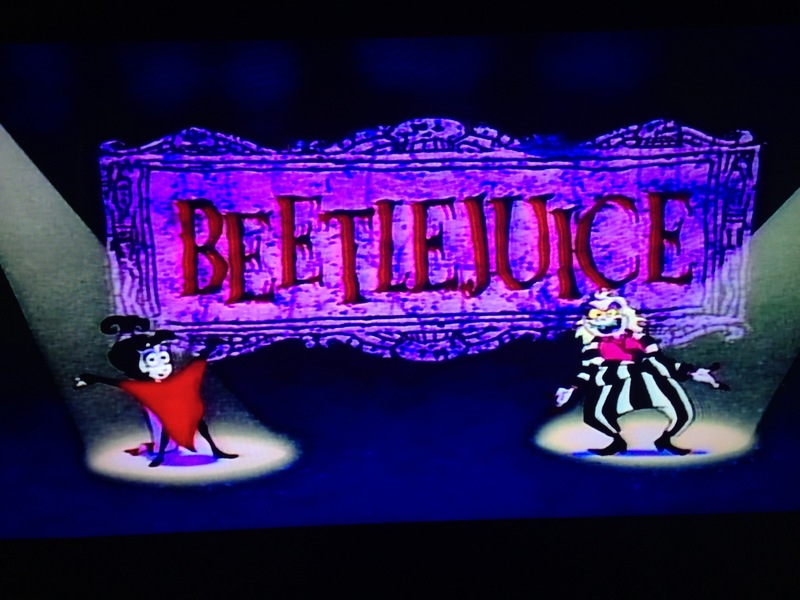 A skeleton knocks on Jacque’s door and says the Beetlejuice likes him, even though he pretends to hate him. While digging through books, Ginger confronts Beetlejuice about not liking her. He says he doesn’t like anyone. Cue Jacque, happily saying how Beetlejuice likes him, and running towards him. Beetlejuice opens the door, and causes Jacque to collide with the mob. Lydia says that Beetlejuice’s skeletons are upsetting everyone. Ginger is still crying. Rooty throws fruit at Beetlejuice. Lydia finds how to get rid of skeletons. Jacque asks why anyone would want to. Lydia says the only way to get rid of skeletons in your closet is to tell the truth, and that he can’t run from them anymore. He says he doesn’t needs her help. “Lies!” He can handle the problem. “Lies!” It’s not his fault. “Lies!” He didn’t know. “Lies!” Lydia demands he tell the truth about something, and asks who his best friend is. Jacque says its him. Ginger knows it isn’t her. Beetlejuice says that Lydia is his best friend. When he does, some of the skeletons pop. Beetlejuice says that truth stuff really works, and Lydia should try it quick. She says she’ll tell the truth about the skunk. The skeleton appears in front of a half-asleep Charles, and starts to say Lydia lied, but disappears. Charles chocks it up to Delia’s cooking. The next morning Lydia returns the skunk to the woods and says that’s one less skeleton in her closet. Beetlejuice agrees, but says it’ll never smell the same. 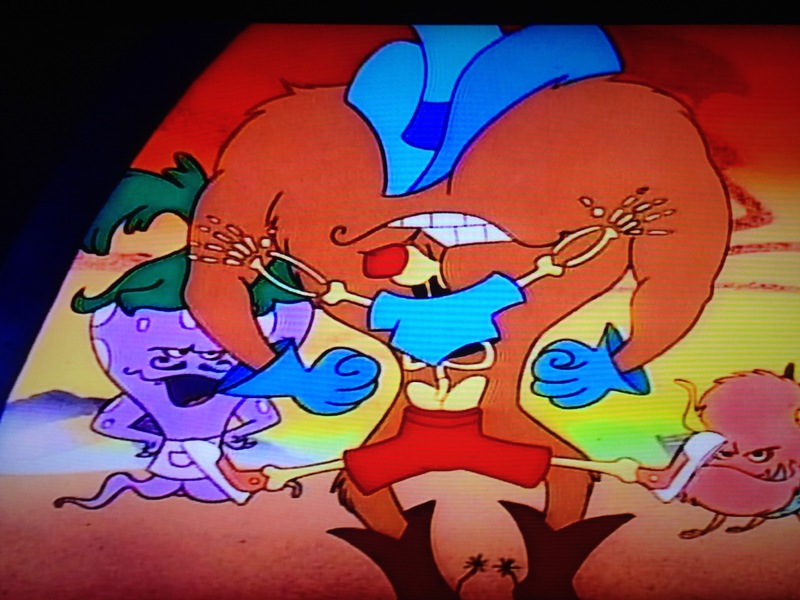 Don’t you love it when a creepy cartoon still manages to have a moral in it, without being all preachy about it? Everyone got the lesson, right? I know I did. Until next time, stay geeky, and keep gabbing!